Some people wish to be organized and neat in ways that can help them improve the way they work in businesses or companies. Sometimes it’s a practice while for others, it’s a great necessity. People working in companies or managing small businesses need to have a spreadsheet in order to properly allocate their responsibilities such as expenses and budget. 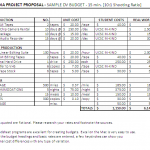 For people searching for this type of document, we offer our free monthly budget template. 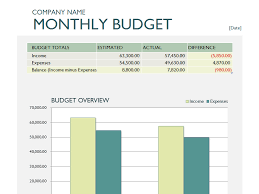 The free monthly budget template is designed in a way where you can see your budget costs per month. The template offers you twelve different sheets which correspond to the twelve months per year. 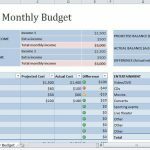 With this monthly budget template, everything has been clearly categorized into details which will correspond to the twelve-month budget plan. The first page of the template can be called as somewhat of a summary but we’ll get to the reason exactly why we can call it as a summary. On the top left side of the first sheet is the company logo, which provides a professional look to your document. Space has also been provided for the company name, which is notable large enough so that it can be clearly seen and read by the people in charge of it. Now, below the company name is the summary of the entire template, such as the total monthly income, total monthly expenses, and the remaining balance. The summary is put in the first page so that the people checking it for transparency will have a sort of overview of the whole template itself. Below this short summary is the two tables meant for the twelve months in a year. What makes the monthly budget template different from the rest of the templates that we’ve offered is that there are more sheets rather than the usual one or three. This is perfectly appropriate for this type of invoice form because it requires specific details per month in order for it to be summarized at the end of the year in the very first sheet. On the lower half of the first sheet, the tables are meant for the monthly income and monthly expenses. This will only be a summary per month, however, because in the individual sheets meant for each individual month, you have a complete set of lists where you’ll be able to point out the amount and the name of the item. There will be then a total income and total expenses at the very end of each sheet. With these totals, they will be added to the first sheet so that you can see how your performance regarding the business deals and company plans about the budget will be seen.